After a blistering day on Saturday, race day dawned with thin low cloud lying on the hills. This was forecast to burn off but lingered until mid-morning to be replaced by a mix of sunshine and cloud. 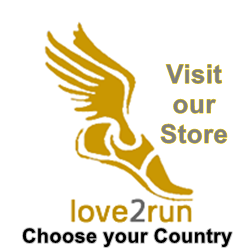 Good weather for running when combined with a few dry days to harden the previously soggy surface. The hot weather meant that the bottles of Celtic Vale water from event sponsor and local business Black Mountain Mineral Water company were in high demand! Entry numbers were slightly down on last year at 74. Unfortunately the forecast high temperatures deterred a number of Cani Cross runners fearful for the wellbeing of their dogs. Only the contingent from Ilkeston Running Club who were mad enough to run the day after taking part in the ‘Man Vs Horse’ event. Mind you, they had a good motivation, running in memory of their clubmate Darren who shares a name with the distinctive crags forming the skyline above Longtown that give their name to the race. Whilst their sanity may have been questioned their commitment couldn’t and nor could that of the fell running novices who came across from the ‘flatlands’ of Cambridgeshire to try their hand at this unique dimension of running. 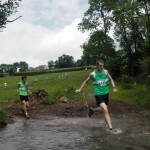 A minor change to this year’s route did not deviate from the requirement to run through the Olchon brook, whilst the early spring rains had also added a marshy section at the end of the steep climb up through farmland. The high temperatures necessitated a water stop at this point which many runners took advantage of before the relentless diagonal climb to the top of the Darrens crags. All the effort was rewarded with magnificent views and a gently undulating ridge taking them towards their descent path which provided a swift route to the valley finish. First time ‘Dasher’ James Smith of Black Pear Joggers, Worcester, led strongly from the start and flew down the descent slopes to set a new course record of 43.12, whilst Niki Morgan from Chepstow Harriers made her way confidently through the field to finish in an impressive 53.34 and set another course record. Simon Downs and his dog Figaro were the first finishers in the Cani Cross event in a time of 76.54. The ‘first local’ trophy was re-instated, congratulations to Archie Gemmell who was awarded the trophy after completing his first ‘Dash’ in 63.50. A special mention to Chris Hawkins (of Forest of Dean Athletic Club) who hobbled to the end of the course with his dog Maya supported by local man Harry Franklin, despite sustaining an ankle injury. 45 children took place in the childrens races and showed their potential for the future. Grateful thanks to Eric and Jean Price, Rob and Julie Bevan, Richard and Anthea Clare, Anthony and Angela Evans, Ruth Pritchard, Richard Prosser, the Black Mountain Graziers, Natural England and the Brecon Beacons National Park for their permission to run across their land. A special thank you to Black Mountain Mineral Water Company who not only sponsor the event drinking water but also sponsor the event trophies. Why not join us in June next year for the 10th Anniversary Race? Click here for more details of the 2014 Darrens Dash, including results.